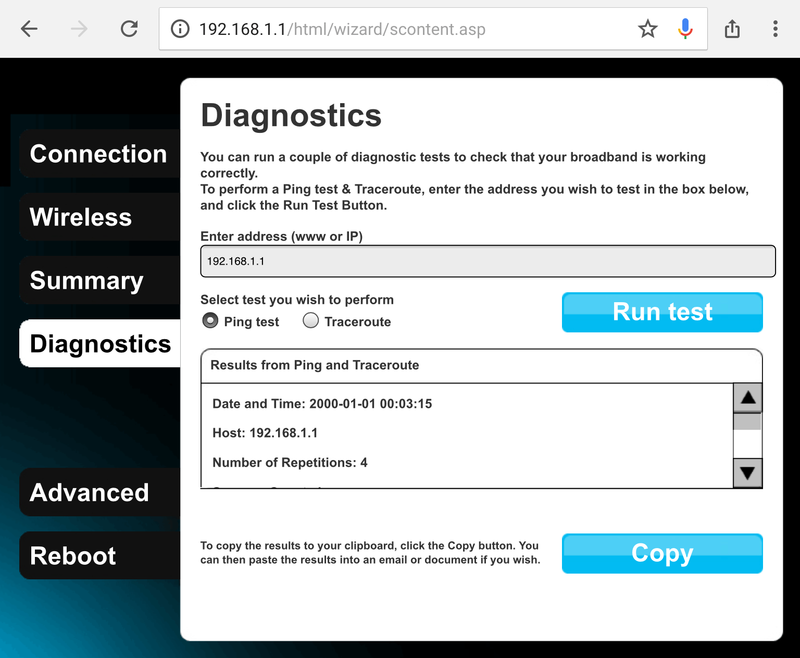 TP-Link’s all-in-one SR20 Smart Home Router allows arbitrary command execution from a local network connection, according to a Google security researcher. 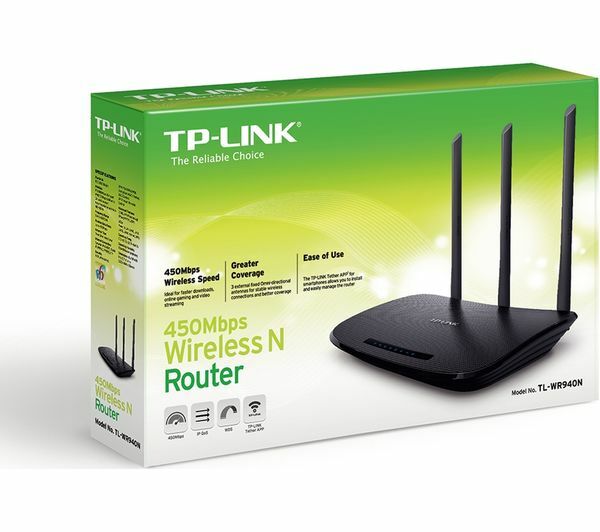 On Wednesday, 90 days after he informed TP-Link of the issue and received no response, Matthew Garrett, a well-known Google security engineer and open-source contributor, disclosed a proof-of-concept exploit to demonstrate a vulnerability affecting TP-Link’s router. The 38-line script shows that you can execute any command you choose on the device with root privileges, without authentication. The SR20 was announced in 2016. Via Twitter, Garrett explained that TP-Link hardware often incorporates TDDP, the TP-Link Device Debug Protocol, which has had multiple vulnerabilities in the past. Among them, version 1 did not require a password. Once it receives the command, says Garrett, the router responds to the requesting machine via TFTP, asks for the filename, imports it to a Lua interpreter, running as root, and sends the argument to the config_test() function within the imported file. The Lua os.execute() method passes a command to be executed by an operating system shell. And since the interpreter is running as root, Garret explains, you have arbitrary command execution. However, while TDDP listens on all interfaces, the default firewall prevents network access, says Garrett. This makes the issue less of a concern that remote code execution flaws identified in TP-Link 1GbE VPN routers in November. Even so, vulnerability to a local attack could be exploited if an attacker manages to get a malicious download onto a machine connected to an SR20 router. TP-Link did not immediately respond to a request for comment. Garrett concluded his disclosure by urging TP-Link to provide a way to report security flaws and not to ship debug daemons on production firmware. Can you hear me in the… front? I came into work to find an unusually high number of private Slack messages. They all pointed to the same tweet. Why would this matter to me? 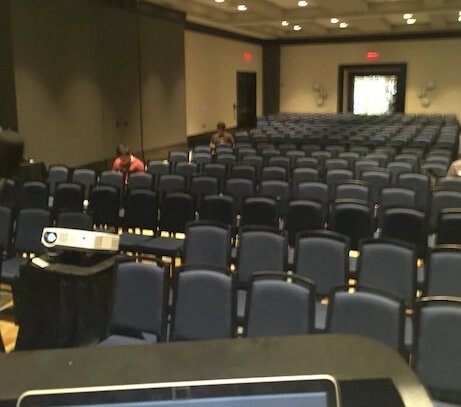 I gave a talk at Derbycon about hunting for bugs in MikroTik’s RouterOS. I had a 9am Sunday time slot. 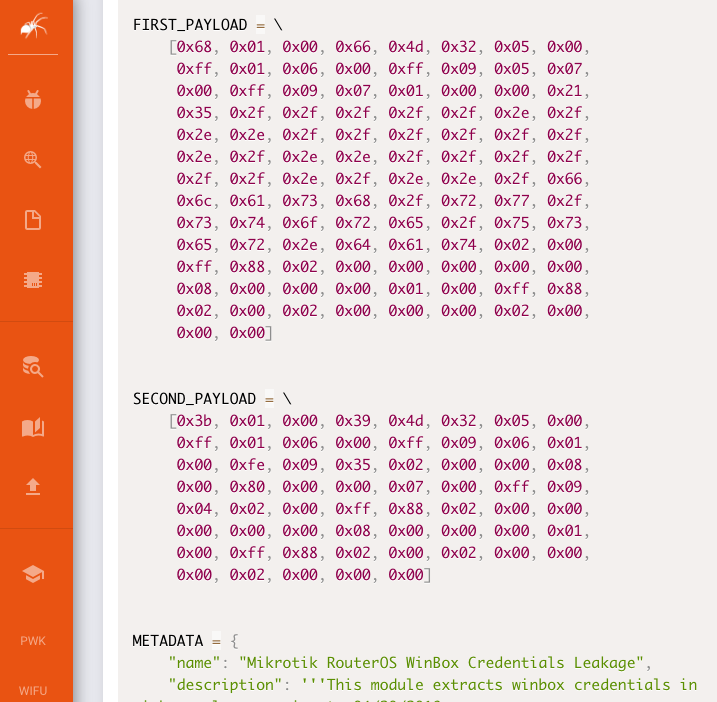 Now that Zerodium is paying out six figures for MikroTik vulnerabilities, I figured it was a good time to finally put some of my RouterOS bug hunting into writing. Really, any time is a good time to investigate RouterOS. It’s a fun target. Hell, just preparing this write up I found a new unauthenticated vulnerability. You could too. Now I know you’re already looking up Rolex prices, but calm down, Sparky. You still have work to do. Even if you’re just planning to download a simple fuzzer and pray for a pay day, you’ll still need to read this first section. You don’t have to rush to Amazon to acquire a router. MikroTik makes RouterOS ISOs available on their website. The ISO can be used to create a virtual host with VirtualBox or VMWare. You can also extract the system files from the ISO. MikroTik packages a lot of their software in their custom .npk format. There’s a tool that’ll unpack these, but I prefer to just use binwalk. 0             0x0             NPK firmware header, image size: 15616295, image name: "system", description: ""
9928025       0x977D59        Copyright string: "Copyright 1995-2005 Mark Adler "
When looking for vulnerabilities it’s helpful to have access to the target’s filesystem. It’s also nice to be able to run tools, like GDB, locally. 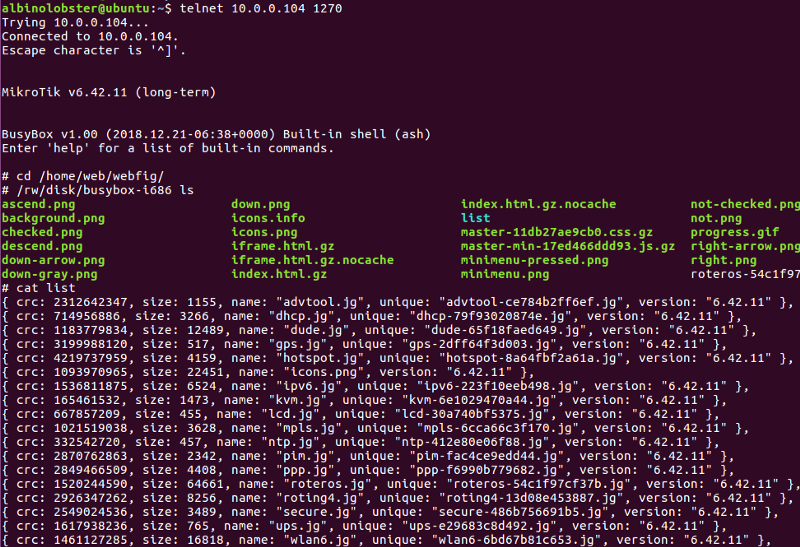 However, the shell that RouterOS offers isn’t a normal unix shell. It’s just a command line interface for RouterOS commands. Fortunately, I have a work around that will get us root. RouterOS will execute anything stored in the /rw/DEFCONF file due the way the rc.d script S12defconf is written. A normal user has no access to that file, but thanks to the magic of VMs and Live CDs you can create the file and insert any commands you want. The exact process takes too many words to explain. Instead I made a video. The screen recording is five minutes long and it goes from VM installation all the way through root telnet access. With root telnet access you have full control of the VM. You can upload more tooling, attach to processes, watch logs, etc. 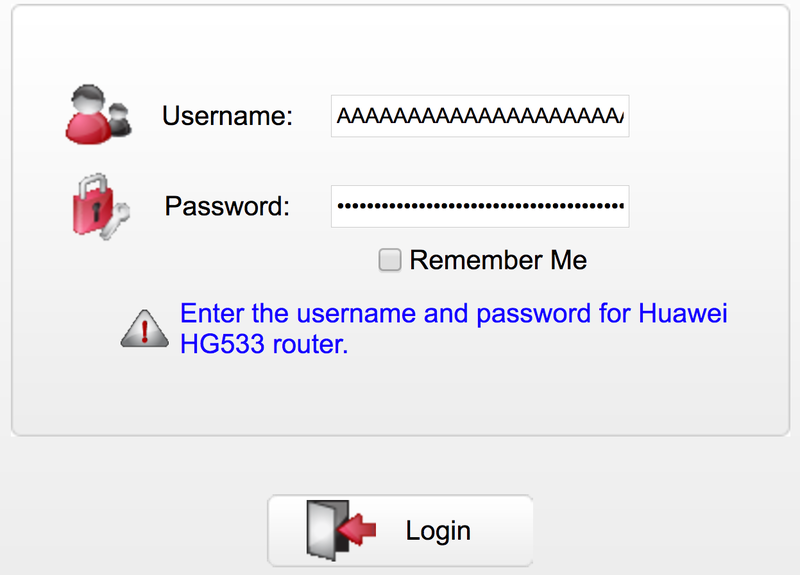 You’re now ready to explore the router’s attack surface. You can quickly determine the network reachable attack surface thanks to the ps command. Looks like the router listens on some well known ports (HTTP, FTP, Telnet, and SSH), but also some lesser known ports. btest on port 2000 is the bandwidth-test server. mproxy on 8291 is the service that WinBox interfaces with. 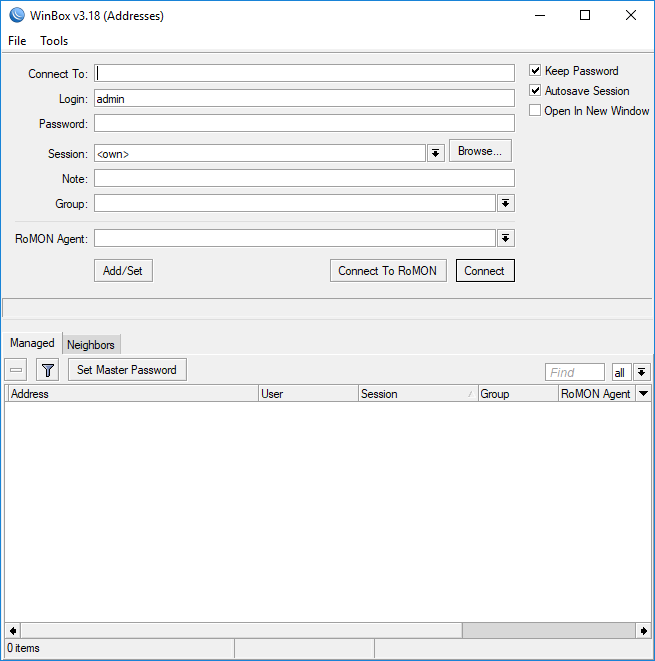 WinBox is an administrative tool that runs on Windows. It shares all the same functionality as the Telnet, SSH, and HTTP interfaces. Hello, I load .dll straight off the router. Yes, that has been a problem. Why do you ask? The ps output makes it appear as if there are only a few binaries to bug hunt in. But nothing could be further from the truth. Both the HTTP server and Winbox speak a custom protocol that I’ll refer to as WinboxMessage (the actual code calls it nv::message). The protocol specifies which binary a message should be routed to. In truth, with all packages installed, there are about 90 different network reachable binaries that use the WinboxMessage protocol. There’s also an easy way to figure out which binaries I’m referring to. A list can be found in each package’s /nova/etc/loader/*.x3 file. x3 is a custom file format so I wrote a parser. The example output goes on for a while so I snipped it a bit. 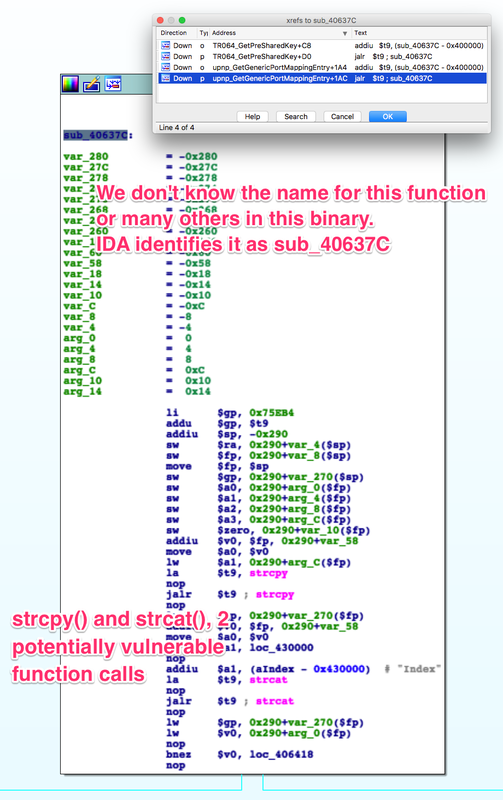 The x3 file also contains each binary’s “SYS TO” identifier. This is the identifier that the WinboxMessage protocol uses to determine where a message should be handled. Knowing which binaries you should be able to reach is useful, but actually knowing how to communicate with them is quite a bit more important. In this section, I’ll walk through a couple of examples. Let’s say I want to talk to /nova/bin/undo. Where do I start? Let’s start with some code. I’ve written a bunch of C++ that will do all of the WinboxMessage protocol formatting and session handling. I’ve also created a skeleton programthat you can build off of. main is pretty bare. std::cerr << "Failed to connect to the remote host"
You can see the Winbox_Session class is responsible for connecting to the router. It’s also responsible for authentication logic as well as sending and receiving messages. 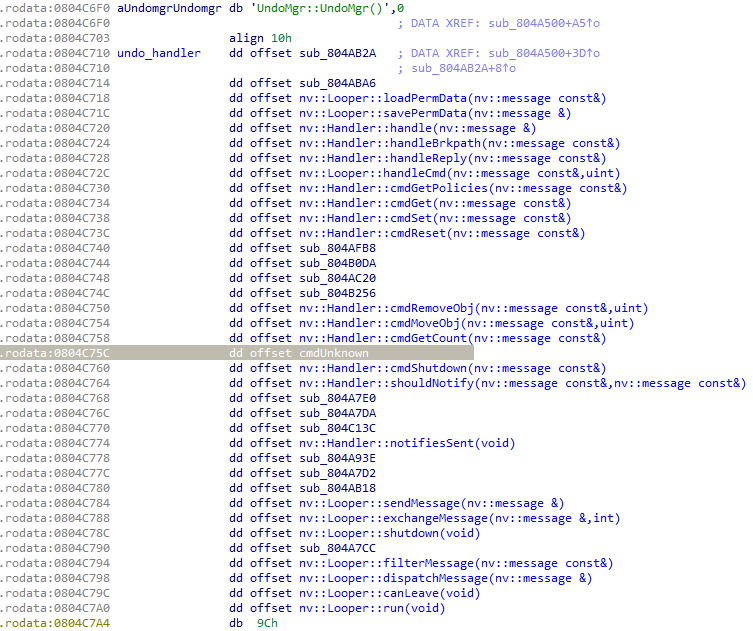 Now, from the output above, you know that /nova/bin/undo has a SYS TO identifier of 17. In order to reach undo, you need to update the code to create a message and set the appropriate SYS TO identifier (the new part is bolded). Each message also requires a command. As you’ll see in a little bit, each command will invoke specific functionality. There are some builtin commands (0xfe0000–0xfe00016) used by all handlers and some custom commands that have unique implementations. Pop /nova/bin/undo into a disassembler and find the nv::Looper::Looperconstructor’s only code cross reference. Follow the offset to vtable that I’ve labeled undo_handler and you should see the following. This is the vtable for undo’s WinboxMessage handling. A bunch of the functions directly correspond to the builtin commands I mentioned earlier (e.g. 0xfe0001 is handled by nv::Handler::cmdGetPolicies). You can also see I’ve highlighted the unknown command function. Non-builtin commands get implemented there. Since the non-builtin commands are usually the most interesting, you’re going to jump into cmdUnknown. You can see it starts with a command based jump table. It looks like the commands start at 0x80001. Looking through the code a bit, command 0x80002 appears to have a useful string to test against. Let’s see if you can reach the “nothing to redo” code path. You need to update the skeleton code to request command 0x80002. You’ll also need to add in the send and receive logic. I’ve bolded the new part. My exploit for CVE-2018–14847 delivers a root shell. Just sayin’. Open /nova/bin/mproxy in IDA and find the nv::Looper::addHandler import. In 6.42.11, there are only two code cross references to addHandler. It’s easy to identify the handler you’re interested in, handler 2, because the handler identifier is pushed onto the stack right before addHandler is called. Opens a file in /var/pckg/ for writing. Writes to the open file. Opens a file in /var/pckg/ for reading. Creates a directory in /var/pckg/. Opens a file in /home/web/webfig/ for reading. Commands 4, 5, and 7 do not require authentication. Let’s try to open a file in /home/web/webfig/ with command 7. This is the command that the FIRST_PAYLOAD in the exploit-db screenshot uses. If you look at the handling of command 7 in the code, you’ll see the first thing it looks for is a string with the id of 1. The string is the filename you want to open. What file in /home/web/webfig is interesting? The real answer is “none of them” look interesting. But list contains a list of the installed packages and their version numbers. Let’s translate the open file request into WinboxMessage. Returning to the skeleton program, you’ll want to overwrite the set_to and set_commandcode. You’ll also want to insert the add_string. I’ve bolded the new portion again. You can see the response from the server contains u2:1818. Look familiar? As this is running quite long, I’ll leave the exercise of reading the file’s content up to the reader. This very simple CVE-2018–14847 proof of concept contains all the hints you’ll need. I’ve shown you how to get the RouterOS software and root a VM. I’ve shown you the attack surface and taught you how to navigate the system binaries. I’ve given you a library to handle Winbox communication and shown you how to use it. If you want to go deeper and nerd out on protocol minutiae then check out my talk. Otherwise, you now know enough to be dangerous. L,DR; not a while ago, right after hearing California is raising its eyebrows on internet-connected device security, Daniel Eshetu and I were exploring the current security state of popular Network Attached Storage (NAS) devices. The California Consumer Privacy ACT,which influenced such measures requires manufacturers to have hardened and above-average enterprise security, enforcing much interesting and unusual care for devices; mainly the so called internet-connected “IoT” devices. In my opinion it should be mandatory to have such security standards for devices that spread so rapidly, especially if they are are mandated correctly and put manufactures on the spot for not caring. So while dissecting the firmware of the first NAS, it became clear we weren’t dealing with one of those easy-to-compromise kumbaya codebases. Axentra had clean code, no obvious backdoors and even had proper security measures in case something should go wrong. Looking online, ~2 million online NAS can be found. Interesting target, well-spread, good codebase. Our research was supported by the privacy advocate WizCase. This is a prolonged post detailing how it was possible to craft an RCE exploit from a tricky XXE and SSRF. Axentra Hipserv is a NAS OS that runs on multiple devices including NetGear Stora, SeaGate Home, Medion LifeCloud NAS and provides cloud-based login, file storage, and management functionalities for different devices. It’s used in different devices from different vendors. The company provides a firmware with a web interface that mainly uses PHP as a backend. The web interface has a rest API endpoint and a pretty typical web management interface with file manager support. After extracting the firmware using binwalk, the backend source were located in /var/www/html/with the webroot in /var/www/html/html. The main handler for the web interface ishomebase.php, and RESTAPIController.php is the main handler for the rest API. All the php files were encoded using IONCube which has a public decoder, and given the version used was an old one, decoding the files didn’t take long. Once the files were decoded we proceeded to look at the source code, most of it was well written. During the initial analysis we looked at different configuration files which we thought might come into play. One of them was php.ini located in /etc which contained the configuration line ‘register_globals=on’, this was pretty exciting as turning register_globals on is a very insecure configuration and could lead to a plethora of vulnerabilities. But looking through the entire source code, we could not find any chunk of code exploitable through this method. The Axentra code as mentioned before was well written and variables where properly initialized, used and carefully checked, so register_globals was not going to work. As we kept looking through the source code and moved on to the REST-API endpoint things got a little more interesting, the initial requests are routed through RESTAPIController.phpwhich loads proper classes from /var/www/html/classes/REST and the service classes were in/var/www/html/classes/REST/services in individual folders. While looking through the services most of them were properly authenticated, but there were a few exceptions that were not, one of these was the request aggregator endpoint located at/www/html/classes/REST/services/aggregator in the filesystem and/api/2.0/rest/aggregator/xml from the web url. We will look at how this service works and how we were able to exploit it. The first file in the directory was AxAggregatorRESTService.php. This file defines and constructs the rest service. Files of the same structure exist in every service directory with different names ending with the same RESTService.php suffix. In this file there were interesting lines (shown below). Note that line numbers might be inaccurate since the files were decoded and we didn’t bother to remove the header generated by the decoder (a block of comment at the beginning of each file plus random breaks). line 13: private $requiresAuthenticatedHipServUser = false; //This shows the service does not require authentication. line 14: private $serviceName = ‘aggregator’; //the service name.. The code on line 18 calls a function called loadResourceClass with is provided by axentras RESTAPI framework and loads a resource (service handler) class/file from the current rest services directory after adding the appropriate prefix (Ax) and suffix (RESTResource.php). The code for this function is shown below. The next file we had to look at was AxXMLAggregatorRESTResource.php which is loaded and executed by the REST framework. This file defines the functionality of the REST API endpoint, inside of it is where our first bug was found (XXE). Let’s take a look at the code. libxml_disable_entity_loader(false), but one thing to note here is the Axentra firmware uses the libxml library to parse xml data, and libxml started disabling external entity loading by default starting from libxml2 version 2.9 but Axentras firmware has version 2.6 which does not have external entity loading disabled by default, and this leads to an XXE attack, the following request was used to test the XXE. Now that we had XXE working, we could try and read files and try to dig out sensitive info, but ultimately we wanted full remote control. The first thought was to extract the sqlite database containing all usernames and passwords, but this turned out to be a no go since xxe and binary data don’t work so well together, even encoding the data using php filters would not work. And since this method would have required another RCE in the webinterface to take full control of the device, we thought of trying something new. Since we could make a request from the device (SSRF), we tried to locate endpoints that bypass authentication if the request came from localhost (very common issue/feature?). However, we could not find any good ones and so we moved into the internals of the NAS system specifically how the system executes commands as root (privileged actions). Now this might have not been something to look at if the user-id the web server is using had some sort of sudo privilege, but this was not the case. And since we saw this during our initial overlook of the firmware we knew there was another way the system was executing commands. After a few minutes of searching we found a daemon that the system used to execute commands and found php scripts that communicate with this daemon. We will look at the details below. The requests to this daemon are sent using xml format and the file is located in/var/www/html/classes/AxServerProxy.php, which calls a function named systemProxyRequestto send the requests. The systemProxyRequest is located in the same file and the code is given below. As clearly seen above the function takes xml data and cleans out a few things like spaces and sends it to the daemon listening on port 2000 of the local machine. 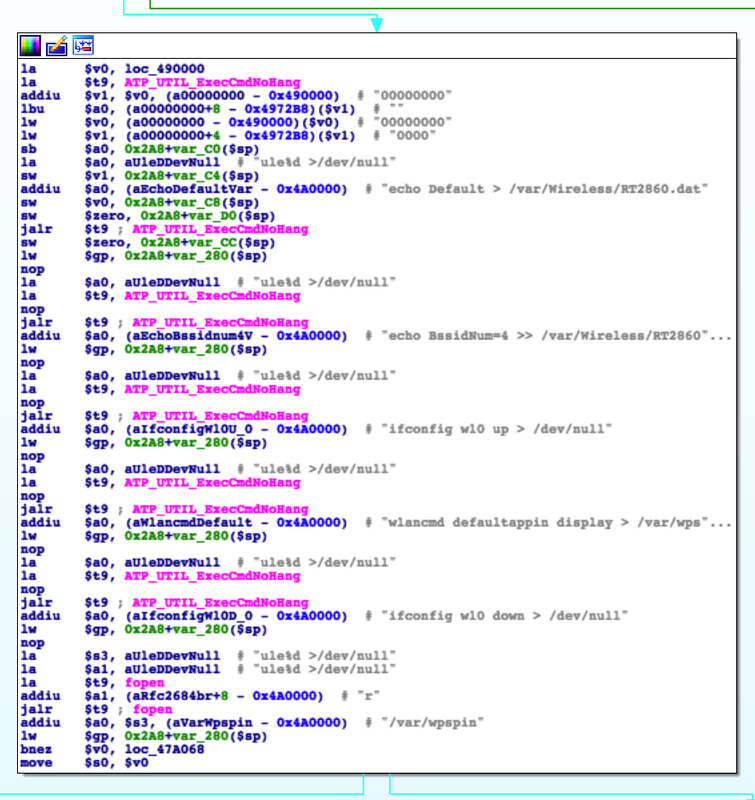 The daemon is located at/sbin/oe-spd and is a binary file, so we looked into it using IDA, the following pieces of code were generated by the Hex-Rays decompiler in IDA. This function receives the data from the socket as an argument (a2) and parses it. The line above is important to us mainly because the request is sent through the HTTP protocol so the daemons «feature» to skip over the junk data allows us to embed our payload in an http request to http://127.0.0.1:2000 (the daemons port) without worrying about formatting or the daemon bailing because of unknown characters; it does the same thing with junk data after the xml too. Now, we skipped over looking into how the whole oe-spd daemon code works, mainly because we had our sights set on finding and exploiting a simple RCE bug, and we had all we need to test out a few ways we could go about achieving that, we had the format of the messages fromAxServerProxy.php and some from usr/lib/spd/scripts/. The method we used to find the RCE was sending the request through curl, and tracing the process with strace while running in a qemu environment, this helped us filter out execve calls with the right parameters to use as a payload. As a note there were A LOT of vulnerable functions in this daemon, but in the following we only show the one we used to achieve RCE. The interested one’s among you can explore the daemon using the hints we gave above. the command execution bug should be clearly visible here, but in case you missed it, the 4th line in the strace output shows out input (BOGUS_DEVICE) being passed to a /bin/sh call, now we send a test injection to see if our command execution works. If you take a close look of the output, it can be seen that «echo pwnEd» command we gave in backticks has been evaluated and the output is being used as a part of a later command. To make this PoC simpler, we just write a file in /tmp and see if it exists in the device. Now we have complete command execution. In order to chain this bug with our XXE and SSRF we have to make the xml parser send a request to http://127.0.0.1:2000/ with the payload. Although sending a normal http request to the daemon was not a problem, things fell apart when we tried to append the payload as a url location in the xml file, the parser failed with an error (Invalid Url) so we had to change our approach. After a few failed attempts we figured out the libxml http client correctly follows 301/2 redirections and this does not make the parser fail since the url given in the redirection does not pass through the same parser as the initial url in the xml data, so we created a little php script to redirect the libxml http client to http://127.0.0.1:2000/ with the payload embedded as a url path. The script is shown below. The above redirection should execute our command injection and create a pwned.txt file in the webroot with the output of id, the following request checks the output and existence of the file. Yay! our pwned.txt has been created and the exploit was successful. We have a video demo showing the full exploit chain from XXE to SSRF to RCE being used to create a reverse root shell. We will post the video and the exploit code soon. This research was the basis of us looking into more NAS devices, like WD MyBook and discovering multiple critical root RCE vulnerabilities that ultimately impacted millions of devices from western countries were published on our research published on WizCase blog here. Unfortunately, Axentra, the affected devices, and even WD, chose silence. Some have responded saying there will NOT BE any patches for the vulnerabilities affecting millions! This is where, soon in the future, the enforced involvement of laws like The California Consumer Privacy ACT can come to play by holding manufactures responsible for their actions, in this case, at-least regarding patching! In part 4 we extracted the entire firmware from the router and decompressed it. As I explained then, you can often get most of the firmware directly from the manufacturer’s website: Firmware upgrade binaries often contain partial or entire filesystems, or even entire firmwares. In this post we’re gonna dig through the firmware to find potentially interesting code, common vulnerabilities, etc. I’m gonna explain some basic theory on the Linux architecture, disassembling binaries, and other related concepts. Feel free to skip some of the parts marked as [Theory]; the real hunt starts at ‘Looking for the Default WiFi Password Generation Algorithm’. At the end of the day, we’re just: obtaining source code in case we can use it, using grep and common sense to find potentially interesting binaries, and disassembling them to find out how they work. Linux, U-Boot and other tools used in this router are licensed under the General Public License. This license mandates that the source code for any binaries built with GPL’d projects must be made available to anyone who wants it. Having access to all that source code can be a massive advantage during the reversing process. The kernel and the bootloader are particularly interesting, and not just to find security issues. They decide to (illegally) ignore your requests. If this happens to you, consider being nice over trying to get nasty. Huawei’s GPL compliance search page. Mirror of the HG533 release. But what if they’re hiding something!? How could we possibly tell whether the sources they gave us are the same they used to compile the production binaries? Theoretically, we could try to compile the source code ourselves and compare the resulting binary with the one we extracted from the device. In practice, that is extremely more complicated than it sounds. The exact contents of the binary are strongly tied to the toolchain and overall environment they were compiled in. We could try to replicate the environment of the original developers, finding the exact same versions of everything they used, so we can obtain the same results. Unfortunately, most compilers are not built with output replicability in mind; even if we managed to find the exact same version of everything, details like timestamps, processor-specific optimizations or file paths would stop us from getting a byte-for-byte identical match. If you’d like to read more about it, I can recommend this paper. The authors go through the challenges they had to overcome in order to verify that the official binary releases of the application ‘TrueCrypt’ were not backdoored. libc (“The C Library”): It serves as a general purpose wrapper for the System Call API, including extremely common functions like printf, malloc or system. Developers are free to call the system call API directly, but in most cases, it’s MUCH more convenient to use libc. 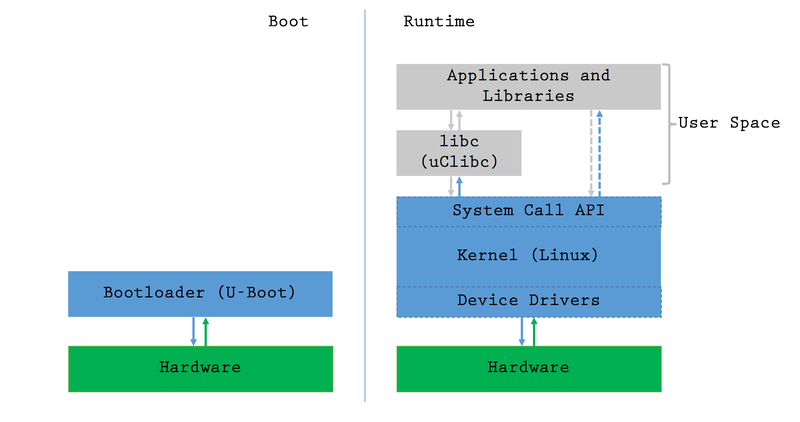 Instead of the extremely common glibc (GNU C library) we usually find in more powerful systems, this device uses a version optimised for embedded devices: uClibc. 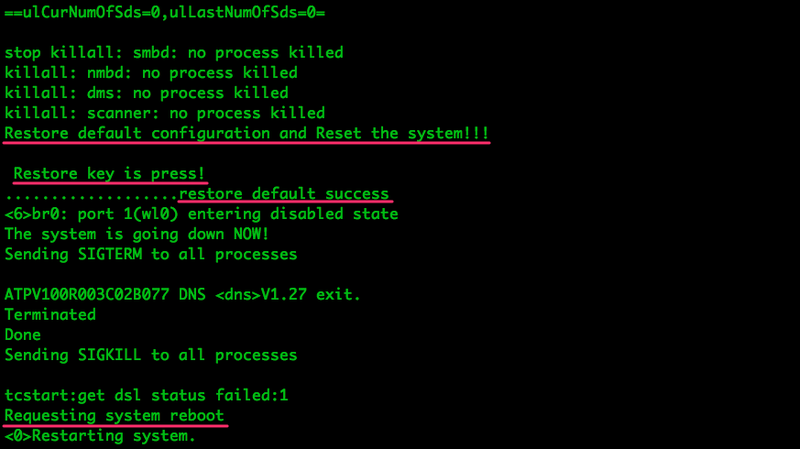 As I’ve mentioned multiple times over this series, this router’s bootloader is U-Boot. 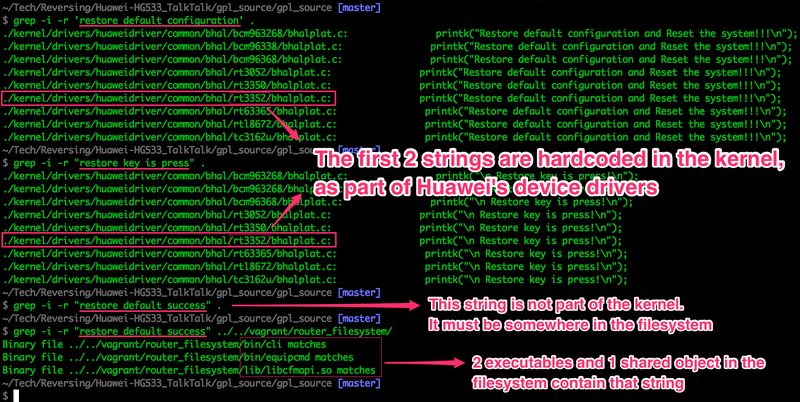 U-Boot is GPL licensed, but Huawei failed to include the source code in their website’s release. Having the source code for the bootloader can be very useful for some projects, where it can help you figure out how to run a custom firmware on the device or modify something; some bootloaders are much more feature-rich than others. In this case, I’m not interested in anything U-Boot has to offer, so I didn’t bother following up on the source code. Having the kernel can help us find poorly implemented security-related algorithms and other weaknesses that are sometimes considered ‘accepted risks’ by manufacturers. Most importantly, we can use the drivers to compile and run our own OS on the device. 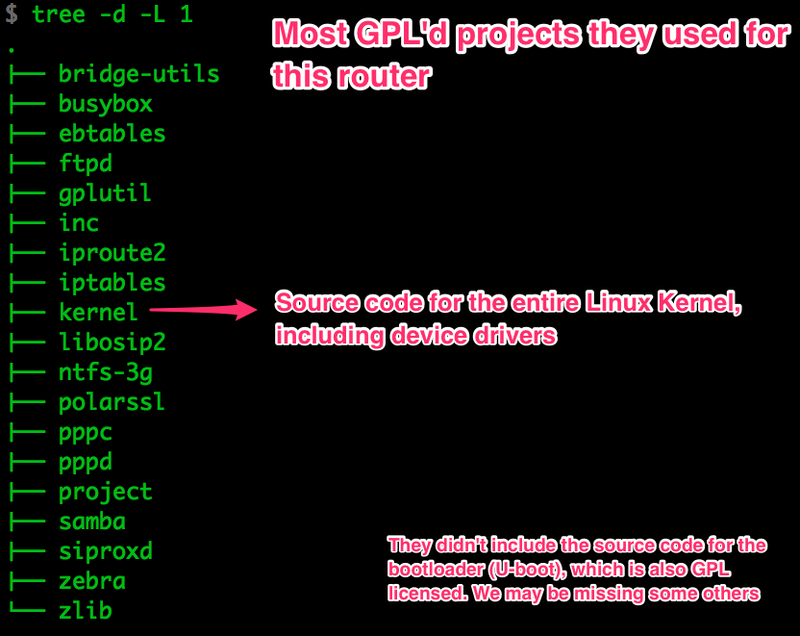 As we can see in the GPL release, some components of the user space are also open source, such as busybox and iptables. Given the right (wrong) versions, public vulnerability databases could be enough to find exploits for any of these. That being said, if you’re looking for 0-days, backdoors or sensitive data, your best bet is not the open source projects. Devic specific and closed source code developed by the manufacturer or one of their providers has not been so heavily tested and may very well be riddled with bugs. 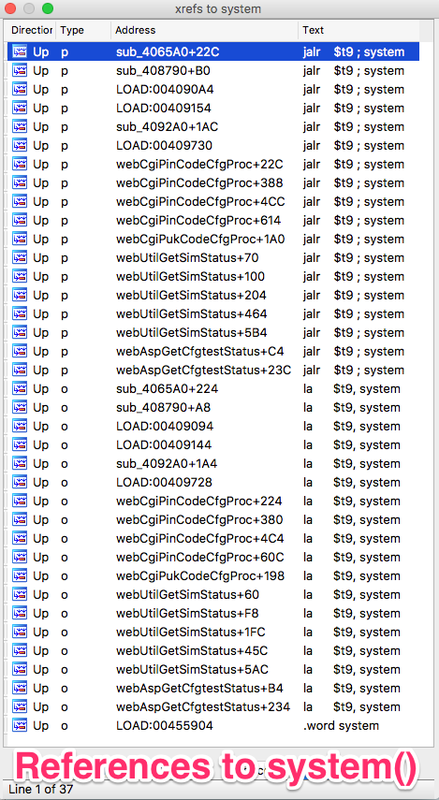 Most of this code is stored as binaries in the user space; we’ve got the entire filesystem, so we’re good. Without the source code for user space binaries, we need to find a way to read the machine code inside them. That’s where disassembly comes in. The code inside every executable binary is just a compilation of instructions encoded as Machine Code so they can be processed by the CPU. Our processor’s datasheet will explain the direct equivalence between assembly instructions and their machine code representations. A disassembler has been given that equivalence so it can go through the binary, find data and machine code andtranslate it into assembly. 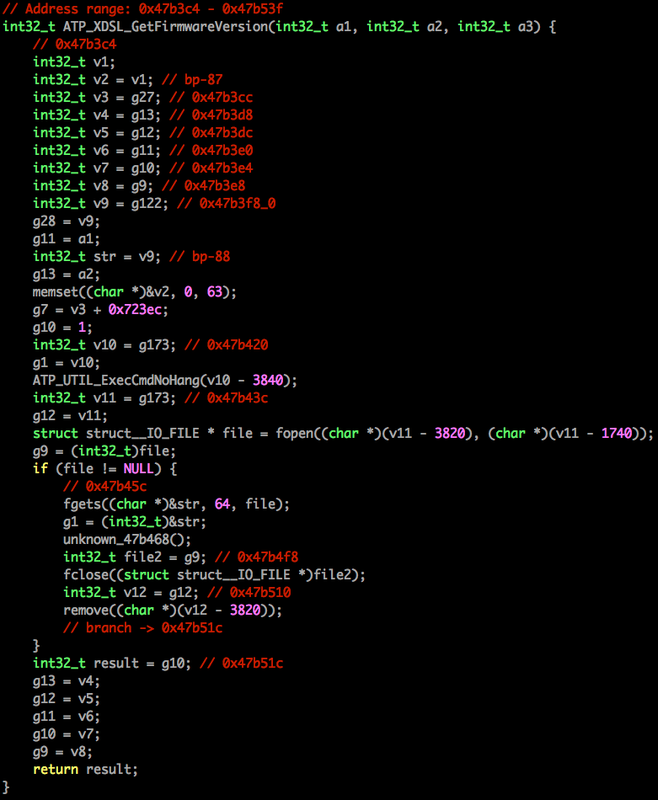 Assembly is not pretty, but at least it’s human-readable. Due to the very low-level nature of the kernel, and how heavily it interacts with the hardware, it is incredibly difficult to make any sense of its binary. User space binaries, on the other hand, are abstracted away from the hardware and follow unix standards for calling conventions, binary format, etc. They’re an ideal target for disassembly. Such a clear representation of branches, and their conditionals, loops, etc. is extremely useful. Without it, we’d have to manually jump from one branch to another in the raw assembly code. Not so fun. If you read the code in that function you can see the disassembler makes a great job displaying references to functions and hardcoded strings. That might be enough to help us find something juicy, but in most cases you’ll need to understand the assembly code to a certain extent. Because ELF headers are designed to be platform-agnostic, we can easily find out some info about our binaries. As you can see, we know the architecture (32-bit MIPS), endianness (LSB), and whether it uses shared libraries. With the exact version of the CPU core, we can easily find its datasheet as released by the company that designed it: Imagination Technologies. MIPS Alternate Register Names: In MIPS, there’s no real difference between registers; the CPU doesn’t about what they’re called. Alternate register names exist to make the code more readable for the developer/reverser: $a0 to $a3 for function arguments, $t0 to $t9 for temporary registers, etc. Beyond instructions and registers, some architectures may have some quirks. One example of this would be the presence of delay slots in MIPS: Instructions that appear immediately after branch instructions (e.g. beqz, jalr) but are actually executed before the jump. That sort of non-linearity would be unthinkable in other architectures. Some interesting links if you’re trying to learn MIPS: Intro to MIPS Reversing using Radare2, MIPS Assembler and Runtime Simulator, Toolchains to cross-compile for MIPS targets. $ grep -i -r "restore default success" . If we look closely, we can almost read the C code that was compiled into these instructions. We can see a “clear configuration file”, which would match the ERASEcommands we saw in the SPI traffic capture to the flash IC. 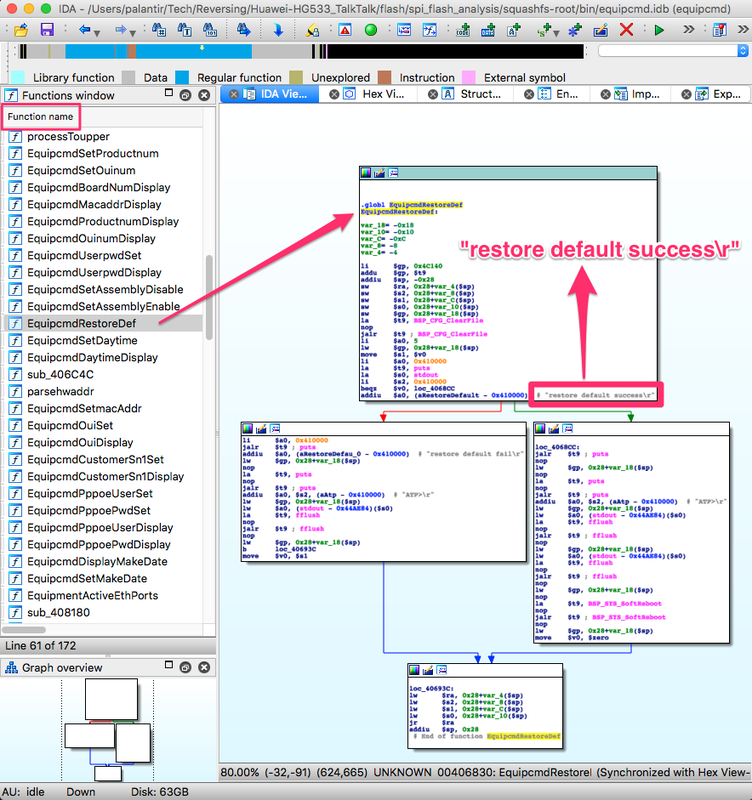 Then, depending on the result, one of two strings is printed: restore default success or restore default fail . On success, it then prints something else, flushes some buffers and reboots; this also matches the behaviour we observed when we pressed the reset button. That function is a perfect example of delay slots: the addiu instructions that set both strings as arguments —$a0— for the 2 puts are in the delay slots of the branch if equals zero and jump and link register instructions. They will actually be executed before branching/jumping. As you can see, IDA has the name of all the functions in the binary. That won’t necessarily be the case in other binaries, and now’s a good time to discuss why. In order to remove them, the developers can use tools like strip, which know what must be kept and what can be spared. These tools serve a double purpose: They save memory by removing data that won’t be necessary at runtime, and they make the reversing process much more complicated for potential attackers. Function names give context to the code we’re looking at, which is massively helpful. In some cases -mostly when disassembling shared objects- you may see somefunction names or none at all. The ones you WILL see are the Dynamic Symbols in the .dymsym table: We discussed earlier the massive amount of memory that can be saved by using shared objects to keep the pieces of code you need to re-use all over the system (e.g. printf()). In order to locate pieces of data inside the shared object, the caller uses their human-readable name. That means the names for functions and variables that need to be publicly accessible must be left in the binary. The rest of them can be removed, which is why ELF uses 2 symbol tables: .dynsym for publicly accessible symbols and .symtab for the internal ones. For more details on symbol tables and other intricacies of the ELF format, check out: The ELF Format — How programs look from the inside, Inside ELF Symbol Tablesand the ELF spec (PDF). Remember the wifi password generation algorithm we discussed in part 3? (The Pot of Gold at the End of the Firmware) I explained then why I didn’t expect this router to have one, but let’s take a look anyway. $ grep -r 'TALKTALK-' . 2 of those 3 binaries (nmbd and smbd) are part of samba, the program used to use the USB flash drive as a network storage device. They’re probably used to identify the router over the network. Let’s take a look at the other one: /bin/cms. Further inspection of this function and other references to ATP_DBSave did not reveal anything interesting. After some time using this process to find potentially relevant pieces of code, reverse them, and analyse them, I didn’t find anything that looked like the password generation algorithm. That would confirm the suspicions I’ve had since we found the default credentials in the protected flash area: The manufacturer used proper security techniques and flashed the credentials at the factory, which is why there is no algorithm. Since the designers manufacture their own hardware, the decision makes perfect sense for this device. They can do whatever they want with their manufacturing lines, so they decided to do it right. I might take another look at it in the future, or try to find it in some other router (I’d like to document the process of reversing it), but you should know this method DOES work for a lot of products. There’s a long history of freely available default WiFi password generators. Since we already know how to find relevant code in the filesystem binaries, let’s see what else we can do with that knowledge. One of the most common, easy to find and dangerous vulnerabilities is command injection. The idea is simple; we find an input string that is gonna be used as an argument for a shell command. We try to append our own commands and get them to execute, bypassing any filters that the developers may have implemented. In embedded devices, such vulnerabilities often result in full root control of the device. A call to libc’s system() (not to be confused with a system call/syscall) is the easiest way to execute a shell command from an application. Sometimes developers wrap system() in custom functions in order to systematically filter all inputs, but there’s always something the wrapper can’t do or some developer who doesn’t get the memo. Which would result in this final string being executed as a shell command: ping google.com -c 1; reboot; ping 192.168.1.1 > /dev/null. If the router reboots, we found a way in. As I said, I couldn’t find anything. Ideally we’d like to verify that for all input fields, whether they’re in the web interface or some other network interface. Another example of a network interface potentially vulnerable to remote command injections is the “LAN-Side DSL CPE Configuration” protocol, or TR-064. Even though this protocol was designed to be used over the internal network only, it’s been used to configure routers over the internet in the past. Command injection vulnerabilities in some implementations of this protocol have been used to remotely extract data like WiFi credentials from routers with just a few packets. 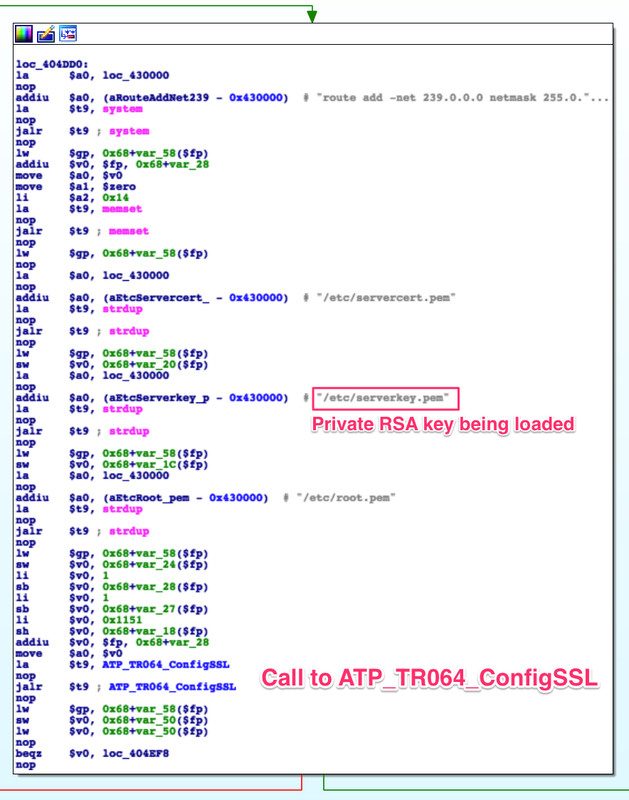 That’s the private RSA key we found in Part 2 being used for SSL authentication. Now we might be able to supplant a router in the system and look for vulnerabilities in their servers, or we might use it to find other attack vectors. Most importantly, it closes the mistery of the private key we found while scouting the firmware. Even if we couldn’t find any command injection vulnerabilities, there are always other vectors to gain control of the router. The most common ones are good old buffer overflows. Any input string into the router, whether it is for a shell command or any other purpose, is handled, modified and passed around the code. An error by the developer calculating expected buffer lengths, not validating them, etc. in those string operations can result in an exploitable buffer overflow, which an attacker can use to gain control of the system. The idea behind a buffer overflow is rather simple: We manage to pass a string into the system that contains executable code. We override some address in the program so the execution flow jumps into the code we just injected. Now we can do anything that binary could do -in embedded systems like this one, where everything runs as root, it means immediate root pwnage. Developing an exploit for this sort of vulnerability is not as simple as appending commands to find your way around a filter. There are multiple possible scenarios, and different techniques to handle them. Exploits using more involved techniques like ROP can become necessary in some cases. That being said, most household embedded systems nowadays are decades behind personal computers in terms of anti-exploitation techniques. Methods like Address Space Layout Randomization(ASLR), which are designed to make exploit development much more complicated, are usually disabled or not implemented at all. If you’d like to find a potential vulnerability so you can learn exploit development on your own, you can use the same techniques we’ve been using so far. Find potentially interesting inputs, locate the code that manages them using function names, hardcoded strings, etc. and try to trigger a malfunction sending an unexpected input. If we find an improperly handled string, we might have an exploitable bug. Once we’ve located the piece of disassembled code we’re going to attack, we’re mostly interested in string manipulation functions like strcpy, strcat,sprintf, etc. Their more secure counterparts strncpy, strncat, etc. are also potentially vulnerable to some techniques, but usually much more complicated to work with. Even though I’m not sure that function -extracted from /bin/tr064— is passed any user inputs, it’s still a good example of the sort of code you should be looking for. Once you find potentially insecure string operations that may handle user input, you need to figure out whether there’s an exploitable bug. Try to cause a crash by sending unexpectedly long inputs and work from there. Why did it crash? How many characters can I send without causing a crash? Which payload can I fit in there? Where does it land in memory? etc. etc. I may write about this process in more detail at some point, but there’s plenty of literature available online if you’re interested. Don’t spend all your efforts on the most obvious inputs only -which are also more likely to be properly filtered/handled-; using tools like the burp web proxy (or even the browser itself), we can modify fields like cookies to check for buffer overflows. Web vulnerabilities like CSRF are also extremely common in embedded devices with web interfaces. Exploiting them to write to files or bypass authentication can lead to absolute control of the router, specially when combined with command injections. An authentication bypass for a router with the web interface available from the Internet could very well expose the network to being remotely man in the middle’d. They’re definitely an important attack vector, even though I’m not gonna go into how to find them. When you decompile a binary, instead of simply translating Machine Code to Assembly Code, the decompiler uses algorithms to identify functions, loops, branches, etc. and replicate them in a higher level language like C or Python. That sounds like a brilliant idea for anybody who has been banging their head against some assembly code for a few hours, but an additional layer of abstraction means more potential errors, which can result in massive wastes of time. In my (admittedly short) personal experience, the output just doesn’t look reliable enough. It might be fine when using expensive decompilers (IDA itself supports a couple of architectures), but I haven’t found one I can trust with MIPS binaries. That being said, if you’d like to give one a try, the RetDec online decompiler supports multiple architectures- including MIPS. Even as a ‘high level’ language, the code is not exactly pretty to look at. Whether we want to learn something about an algorithm we’re reversing, to debug an exploit we’re developing or to find any other sort of vulnerability, being able to execute (and, if possible, debug) the binary on an environment we fully control would be a massive advantage. In some/most cases -like this router-, being able to debug on the original hardware is not possible. In the next post, we’ll work on CPU emulation to debug the binaries in our own computers. Sometimes an address is loaded into a register for 16bit/32bit adjustments. The contents of that address have no effect on the rest of the code; it’s just a routinary adjustment. If the address that is assigned to the register happens to be pointing to some valid data, IDA will rename the address in the assembly and display the contents in a comment. It is up to you to figure out whether an x-ref makes sense or not. If it doesn’t, select the variable and press o in IDA to ignore the contents and give you only the address. This makes the code much less confusing. Set the cursor on a function and press y. Set the prototype for the function: e.g. int memcpy(void *restrict dst, const void *restrict src, int n);. Note:IDA only understands built-in types, so we can’t use types like size_t. Once again we can use the extern declarations found in the GPL source code. When available, find the declaration for a specific function, and use the same types and names for the arguments in IDA. Unfortunately, the function documentation comment is not very useful in this case -seems like there were encoding issues with the file at some point, and everything written in Chinese was lost. At least now we know that the first argument is a list of keys, and the second is something they call ParamCMO. 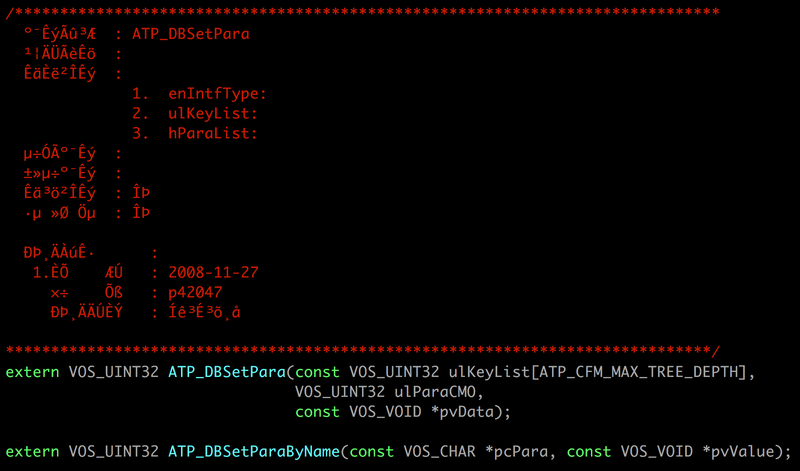 ParamCMO is a constant in our disassembly, so it’s probably just a reference to the key we’re trying to set. The structure of a binary can vary greatly depending on compiler, developers, etc. How functions call each other is not always straightforward for a disassembler to figure out. That means you may run into lots of ‘orphaned’ functions, which exist in the binary but do not have a known caller. Make sure your disassembler supports linear sweep if you feel like you’re missing any data. Make sure the code you’re looking at makes sense if you’re using linear sweep. 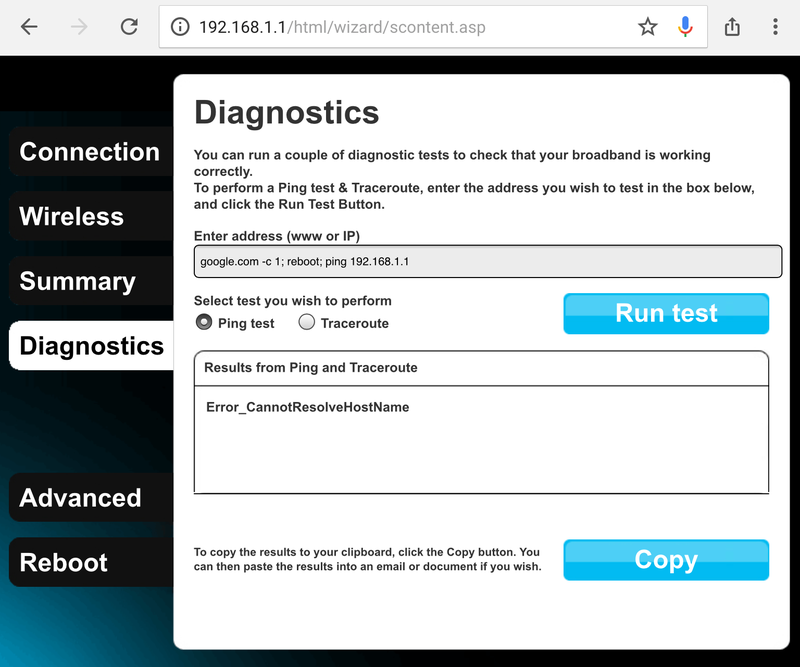 In this post we will be presenting a pre-authenticated remote code execution vulnerability present in Tenda’s AC15 router. We start by analysing the vulnerability, before moving on to our regular pattern of exploit development – identifying problems and then fixing those in turn to develop a working exploit. N.B – Numerous attempts were made to contact the vendor with no success. Due to the nature of the vulnerability, offset’s have been redacted from the post to prevent point and click exploitation. The vulnerability in question is caused by a buffer overflow due to unsanitised user input being passed directly to a call to sscanf. 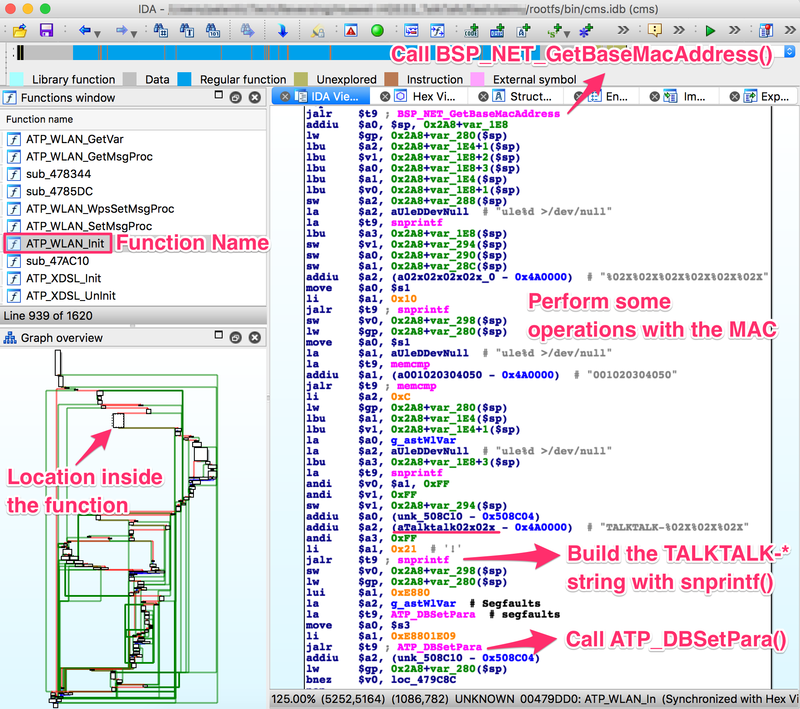 The figure below shows the vulnerable code in the R7WebsSecurityHandler function of the HTTPD binary for the device. Note that the “password=” parameter is part of the Cookie header. We see that the code uses strstr to find this field, and then copies everything after the equals size (excluding a ‘;’ character – important for later) into a fixed size stack buffer. If we send a large enough password value we can crash the server, in the following picture we have attached to the process using a cross compiled Gdbserver binary, we can access the device using telnet (a story for another post). This crash isn’t exactly ideal. We can see that it’s due to an invalid read attempting to load a byte from R3 which points to 0x41414141. From our analysis this was identified as occurring in a shared library and instead of looking for ways to exploit it, we turned our focus back on the vulnerable function to try and determine what was happening after the overflow. In the next figure we see the issue; if the string copied into the buffer contains “.gif”, then the function returns immediately without further processing. The code isn’t looking for “.gif” in the password, but in the user controlled buffer for the whole request. Avoiding further processing of a overflown buffer and returning immediately is exactly what we want (loc_2f7ac simply jumps to the function epilogue). Appending “.gif” to the end of a long password string of “A”‘s gives us a segfault with PC=0x41414141. With the ability to reliably control the flow of execution we can now outline the problems we must address, and therefore begin to solve them – and so at the same time, develop a working exploit. Gain reliable control of PC through offset of controllable buffer. Bypass No Execute (NX, the stack is not executable). Bypass Address space layout randomisation (randomize_va_space = 1). Chain it all together into a full exploit. With problem 1 solved, our next task involves bypassing No Execute. No Execute (NX or DEP) simply prevents us from executing shellcode on the stack. It ensures that there are no writeable and executable pages of memory. NX has been around for a while so we won’t go into great detail about how it works or its bypasses, all we need is some ROP magic. We identify such a gadget in the libc shared library, however, the gadget performs the following instructions.
. We could theoretically guess this value, and we would have a small chance of guessing correct. How do we detect the exploit has been successful? How do we use this exploit to run arbitrary code on the device? 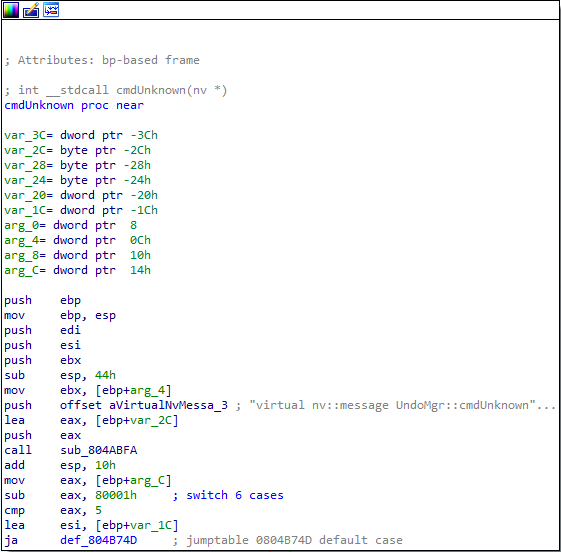 The “malware” binary should give some indication that the device has been exploited remotely, to achieve this, we write a simple TCP connect back program. This program will create a connection back to our attacking system, and duplicate the stdin and stdout file descriptors – it’s just a simple reverse shell. We need to cross compile this code into an ARM binary, to do this, we use a prebuilt toolchain downloaded from Uclibc. We also want to automate the entire process of this exploit, as such, we use the following code to handle compiling the malicious code (with a dynamically configurable IP address). We then use a subprocess to compile the code (with the user defined port and IP), and serve it over HTTP using Python’s SimpleHTTPServer module. * the given ip and port to connect back to. @Param comp_path – This should be the path of the cross-compiler. @Param my_ip – The IP address of the system running this code. * a http server that will serve our malicious binary. * This function is called as a thread, as a daemon process. This code will allow us to utilise the wget tool present on the device to fetch our binary and run it, this in turn will allow us to solve problem 1. We can identify if the exploit has been successful by waiting for connections back. The abstract diagram in the next figure shows how we can make use of a few threads with a global flag to solve problem 1 given the solution to problem 2. * the global DONE flag to indicate successful exploitation. #Loop continuosly, simple reverse shell interface. * This function presents the actual vulnerability exploited. * process restarting any processes that crash. * devices web interface until the DONE flag is set to True. @Param host – the ip address of the target. @Param port – the port the webserver is running on. @Param my_ip – The ip address of the attacking system. #we don’t care about this, so don’t handle it. #Give the device some time to restart the process.